I buy the longest bags I can (18"), then just snip off the extra that I don't need. That allows me to use the same limited assortment of bags to store newer small dailies and the gargantuan ones from the 1910s. 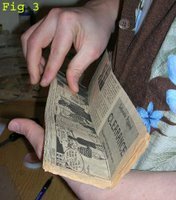 I can also store panel comics, which can be as small as the one column variety at less than 2", to giant 4 and 5 column panel cartoons. There are many companies that sell plastic bags. Some specialize in servicing collectors and they charge a premium. I buy mine from one of the many bag companies that caters to businesses. Businesses, especially manufacturers, buy polyethylene bags in bulk for packaging their products. The bags are made out of the same material as the ones you would buy from a collectors' supply house. There are three differences between a 'manufacturer' bag and a collector's bag. A manufacturer bag typically does not have a flap at the top - the two sides are cut flush. This makes no difference to me because I will be cutting off one end anyway, so I'd lose the flap if it was there. Second, manufacturer bags often have a short plastic tail below the bottom seal. Collector bags are usually cut flush to the seal. A meaningless difference in my opinion. Third, manufacturer bags are most readily available in 2 millimeter and 4 millimeter thicknesses, whereas collector bags are typically 3 millimeter. I actually prefer the 2 mil to the 3 mil because of the way I seal my bags (more on that shortly). The 4 mil thickness, while it may offer more protection and perhaps durability (? 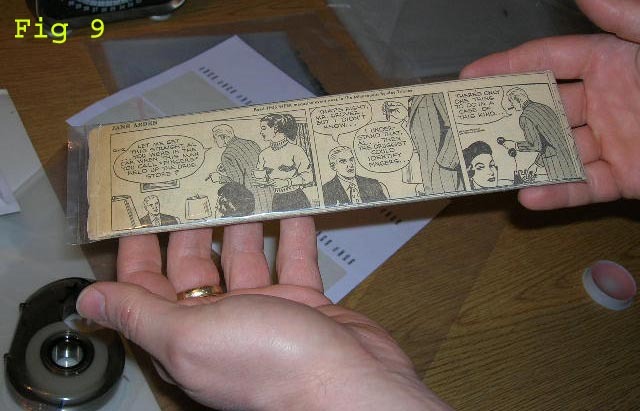 ), I find too stiff to work with using my method for daily strip storage. I buy my storage bags from Uline (http://www.uline.com) and from Bradley's Plastic Bag Company (http://www.bradleybag.com), but there are plenty of other suppliers. Just to give you an idea of how cheap the bags are priced, the latest Bradley's catalog lists the 2 mil 4" x 18" size at $1.87 per hundred. Obviously keeping yourself supplied with bags will not break the bank. 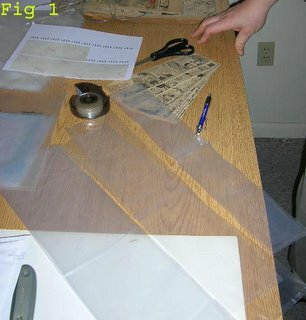 In figure 1 you see an assortment of the storage bags and other materials I use for bagging dailies. Nothing exotic or expensive here. One item of special note is the sheet of labels. I label every bagged daily run with the title, the dates, the count and the source newspaper. Figure 2 shows a close-up. The labels I use are 2 5/8" x 1" and come in sheets of 30 labels. The sheets come blank, of course, and I just run them through my printer to add the text to all the labels on the sheet. Then I hand write the specifics about each daily run as I bag it. 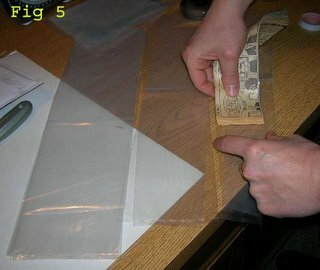 Of course, there's no need to use a special label, you can just write the information on a scrap of paper and insert it in the bags with the strips. Okay - let's bag a typical run of dailies. 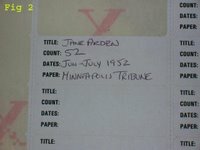 Here I have a run that I bought from another collector, a 2 month run of Jane Arden dailies. 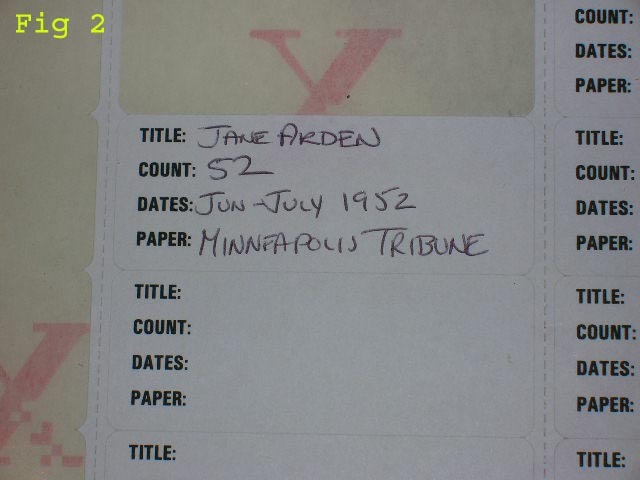 I start by counting them (figure 3) - even if the previous owner provided a count, I always verify it. 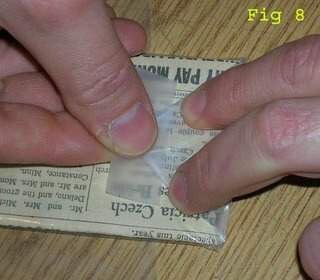 You'll find when counting newspaper dailies that your fingers will quickly get loaded up with gunk, which makes it hard to separate the sheets. 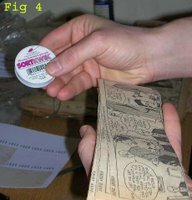 I put a little bit of SortKwik, available at office supply stores, on my fingers (figure 4). It makes them a bit tacky and separating the sheets is much easier. I admit that I worry about the residue, minute though it might be, that I may be leaving on the tearsheets. However, I find that I just can't be sure of an accurate count without it. A safer alternative are the little rubber 'condom' things that you can put on your fingers - these would be safe, but with my big ham hands they don't fit very well. Once the strips are counted and I've filled out the label, I next determine which bag they'll best fit in (figure 5). A simple matter of checking sizes and picking the smallest size. I try to get a tight fit (remember - we're trying to get as little air in there as possible), but if I can't get a good tight fit with the bag sizes I have, I may actually go up one extra size over the minimum. I'll expand on this point in part 4. The Jane Arden strips fit snugly in a 2" bag. 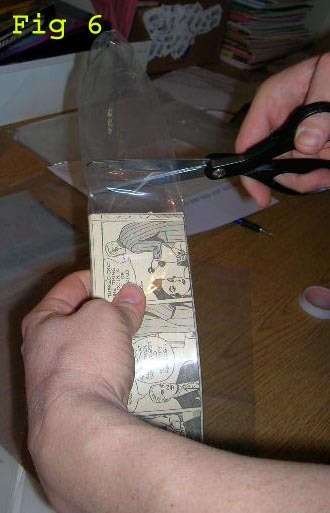 Once I put the strips in the bag I cut off all the excess plastic except for about an inch or so (figure 6). I then press out as much air from the bag as possible, and fold over the cut edge. I do a 'Christmas present' fold (figure 7) because I find that this seems to seal the bag better and keep air from seeping back in. Note that I have a piece of tape at the ready on the end of a finger. This way I can immediately seal the bag, not giving that darn air any chance at re-entry (figure 8). Here's the final product, from the front (figure 9) and the back (figure 10). I always put the label on the back so I can see the whole top strip. 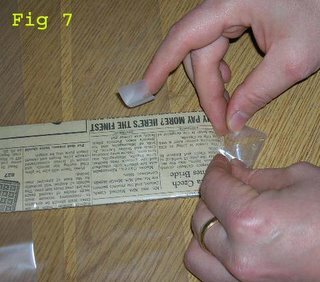 I'm loving the posts at this time on how to bag your strips. this is awesome information, thank you so much. As for the bags, what do you by from uline, I have never purchased anything from them and don't know much about them. Also another thing have you ever been to www.bagsunlimited.com I bought book sleeves from them about 5 years ago and have not seen what they offer for comics. Keep up the awesome work. Bags Unlimited has good products, but they're much more expensive since they are serving the collector market. They also have a very limited selection of bag sizes. I do buy from them, but only items I can't get at Uline or Bradley's (specifically, acid-free backer boards, which I can't find elsewhere). As to what I buy from Uline, that's covered in the post. 2 mil polyethylene bags in the sizes listed. I just thought it may be of some interest to you to know, a while back i came across a british labels company who sold me a batch of plain labels at a really low price. If you are at all interested then it may be worth visiting their website so see if you could save some money on your labels.